Pubic osteomyelitis is a rare disease usually results from various gynecologic and urologic surgeries. We present a-78 year old-woman admitted to the Infectious Department of Imam Khomeini Hospital in June 2014 with pubic osteomyelitis caused by pseudomonas aeruginosa followed by hysterectomy. Keywords: Pubis, osteomyelitis, pseudomonas aeruginosa, hysterectomy, infection, case report. 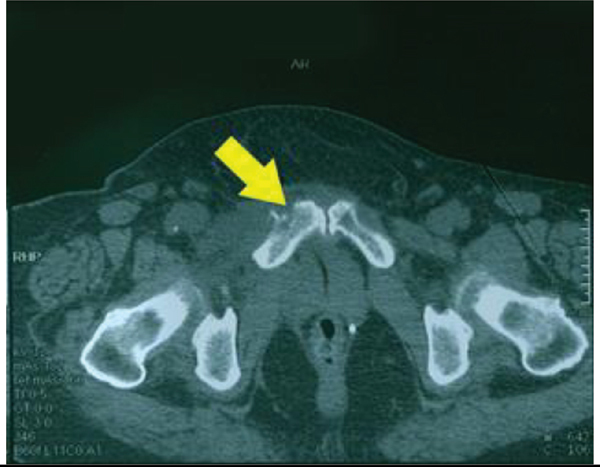 Keywords:Pubis, osteomyelitis, pseudomonas aeruginosa, hysterectomy, infection, case report. Abstract:Pubic osteomyelitis is a rare disease usually results from various gynecologic and urologic surgeries. We present a-78 year old-woman admitted to the Infectious Department of Imam Khomeini Hospital in June 2014 with pubic osteomyelitis caused by pseudomonas aeruginosa followed by hysterectomy.